Read short testimonials of faith from some of MCGI’s youngest brethren baptized on January 8, 2016 at the Ang Dating Daan Convention Center. I saw my friend once watching Bro. Eli. Then, we had a deal with each other that we would attend each other’s ministry. I was Born Again and she was in The Old Path [the Church of God International]. Now, she attended our gatherings twice, and so did I in hers. Once our deal was over, I then realized that there were changes in me when I attended here in the Church of God. I’ve actually long been in the Born Again, almost a year, but I never learned there the right way to kneel, to pray. So I continued watching the program [Ang Dating Daan] on TV, and on Youtube, I watched Bro. Eli’s debates. Thus, the questions in my mind were answered. I guess that’s how the Lord God called me for me to attend the indoctrination. When I got indoctrinated, it took me an extra seven (7) days, a total of three weeks to finish it. I kept on trying because nightly I would dream already of me swimming in a pool, or that I would be taking a shower and the dipper was small so I looked for a big bowl to pour water with over my head. That’s when I thought that perhaps I really need to be baptized already, and obey the laws of the Lord God. I felt happy, and the heaviness in my heart and mind have been lifted. Firstly, I thank the Father God that with the help of the Lord Jesus, He is using Bro. Eli and Bro. Daniel in preaching His words. I am also wholeheartedly giving thanks because whenever I look at Bro. Eli’s face, I feel as if it’s not him anymore who is speaking, but the Holy Spirit of the Lord God who is in him. It is rare for people to be instructed by the Spirit in all knowledge of the Bible’s verses. So Bro. Eli holds a lot of mysteries from the Lord God for him to be able to be enlightened of such truths. So I really hope that those who haven’t yet accepted the teachings of Bro. Eli may continue to listen and investigate for the salvation of their souls, and of their families’ as well. I was lead to the right religion with the help of my parents. It was my father, Bro. Edgardo Ybañez who became a member first, and then my mother and my brother Cliff. I am happy and thankful that finally I have found the true religion, and is with the Lord daily, and our Creator, the Father God. Today, January 8, 2016 I was baptized at 11:09 am, with the help and mercy of the Lord, by Bro. Lito Quizon. I felt so happy, and even when I was just listening to the doctrines of Bro. Eli. I really felt enlightened. My closed eyes have been opened unto the truth. I thought that my former ways were right, but I have known them now to be false beliefs. Now I feel that my heart is so pure, and that anytime I call unto the Lord, He will listen to me because I have a clean heart now. Hello Bro. Eli. When I first listened to your teachings through my papa, I had reservations still. But with God’s help and mercy, in my daily listening to the doctrines, I believed already. Bro. Eli, I hope that you and Bro. Daniel will be given more strength that you may be able to continue your good works. You are the true men sent by the Lord, and you have helped many brethren [and non-members as well]. Thank you. It was through my brother [that I got to know about the Church of God International]. Before, I didn’t believe in Bro. Eli. I was sometimes able to watch him, but I didn’t believe because I thought that what he said was just nothing. Now, when I was able to go to the locale, I heard things that only Bro. Eli was saying, things that I never heard from Catholicism. So that’s when I started and continued ever since without any doubts anymore. What I felt after baptism is that my body was so light, and it’s like you’re not thinking of any problems at all. Bro. Eli and Bro. Daniel, thanks, because if it weren’t for you, I would be able to be close unto the Lord, because you became examples for people to learn what is right, what we must emulate, what we must do for the Lord. I was first a Catholic, then became a being Born Again, then a Mormon, then an Iglesia ni Cristo member. When I was in the Iglesia ni Cristo [Church of Christ], they said we shouldn’t watch The Old Path of Bro. Eli, because we would be misled. But I got curious because, “How would we be misled?” So I got thrilled to watch it. Then one time we had a worship service and a friend of mine invited me to a church gathering here and she brought me here. My friend just got baptized last week. However here, it’s different, because even as I was just being indoctrinated I already felt a different kind of feeling; I felt excitement and that feeling of knowing that this is indeed the true religion. I can’t explain it; it’s inexplicable. My heart is overflowing with joy. Thank you because if it weren’t for you, we wouldn’t know the right doctrines, and we wouldn’t know about the religions that say that they are the true ones but are only deceiving us. My husband has been a member since 2006. But as for me I have been listening to Bro. Eli since childhood on radio. Only, my father was a devout Catholic and their belief was that where they fell in, that’s where they’ll stay. I attended in the the Iglesia ni Cristo [Church of Christ of Manalo], but I didn’t get baptized. I also attended the gatherings of the Baptist, and that’s when the time when I became eager to teach children, but I didn’t get baptized as well. My father got mad when he heard of my religious investigation because he told me where you fell in, that’s where you should stay, and not go to any other place. Then my husband and I were listening to Bro. Eli, and I got surprised when he got baptized in Dubai. As for me I was listening, and as for my father, he said that what Bro. Eli was saying is true. He was a corsilista so he knows about the Bible. So I decided to join now, and I believe that God has called me now. Two years ago, I had already been indoctrinated, and I finished it. But on the day when we were supposed to be baptized, something terrible happened. I [learned I had] developed cancer. Perhaps it’s God’s way, because ever since I got operated, I would thank God for every morning that I saw. So I entrust my life to Him, whatever he wants to do with it. And now I really feel the doctrines; I understand them, and I believe that that understanding comes from God. Last week he invited me to attend the indoctrination but I wasn’t able to go. But this time around I said that I really had to pursue this. The Church Workers gave us special sessions; they went to our warehouse for me to be indoctrinated. Last night, I couldn’t sleep because all I did was just urinate with blood. I was sitting on the toilet bowl all night, and felt weak. But after I got baptized, I felt relieved and even my urination became okay. All I could say afterwards was that, “God, thank you and I hope that I will be able to continue until the end.” Actually, I no longer take medicines. I also regret having my breast removed, because ever since I was a child, it was always the Lord whom I asked help from. So He is what I’m going to count on from now on. I got baptized so that we will also be examples to my two children that they may also understand what the will of God is for our family, and also for my mother because my father has passed away already. But actually, he told me that when I get baptized he would also follow. My mother is Anita and she’s turning 82 in March. I felt so good after baptism. I am really amazed by Bro. Eli. With Bro. Daniel, even when he was still on the morning show on Channel 7, I’ve been listening to him already. I was actually surprised that he wasn’t there anymore, but later I found him on UNTV. Thanks be to the Lord because He uses them. They’re not like other pastors who are greedy, but they really care for the spiritual welfare of people. I pray to the Lord that Bro. Eli’s health will be better, because when Bro. Eli speaks. I really understand him. With other pastors? No. Other pastors seem to be very mild-mannered, but him, he rebukes and it’s because he wants for the spiritual well-being of people to be really well. I was actually surprised the first time I came here because Bro. Eli didn’t ask for any financial contributions. And we were actually the ones, my mother and I, that were asking the Church Workers permission to let us give. It’s unlike in the Baptist or in the INC wherein even when we had just started, they were asking us for financial donations. May the Lord continue to give them more strength that they may be able to save more souls. Many, many thanks unto God. I listened continually to Bro. Eli’s teachings as my daughter had CDs of Bro. Eli answering questions from people. I know that what I hear from Bro. Eli is in the Bible. Only, I read the Bible before but I didn’t understand it. But when I attended the church services here I understood the meaning. I believe that my mind has been enlightened. It’s unlike in Catholicism wherein you just attend mass, but there’s no explanation as to why things are like this and like so. My other son is a Born Again Christian and is a pastor there, and they would invite us to attend in their gatherings. Sometimes, they would go to our house to pick us up in their car, but we wouldn’t be able to go as something always came up, like me having a stomach ache or something. Here, I am able to attend on Sundays, and when my son-in-law came home here, we got indoctrinated. And understood the things that Bro. Eli is speaking. Now I am here in The Old Path [the Church of God International]. This is what I have found in life; that’s all I can say. I used to feel heavy at times, even feverish and my body always felt warm. Then after I got baptized, I really felt light and relieved and happy. I even cried because I remembered the sins I have done ever since I was young and up to this age. I felt very light, and I’m not always angry anymore. I hope that I will be able to participate in the works of the ministry. I hope that the Lord will give me strength for me to be able to fulfill my duties. That is my prayer to God, for Him to give me strength that I may be able to help the ministry; that is what I wish. I am thankful that I am here. I am thankful for them because of the doctrines that they read in the Bible and give to people. Now, I understand what I used to only read in the Bible and not know the explanation behind it. Bro. Eli gives the definitions I am able to understand them. I’m happy that my mind has been enlightened that this is the truth and now I’m here. Many, many thanks unto the Lord that’s all I can say. Read short testimonials of faith from some of MCGI’s youngest brethren baptized on September 11, 2015 at the ADD Convention Center in Apalit, Pampanga. I want to have a new life, and for my sins to be cleansed. I’m now ready to serve the Lord. I’m prepared already. My neighbor invited me to a Bible Exposition at first. He just told me to listen to the topics, and I found it okay. Everything was taken from the Bible. And that’s when I learned that if it comes from the Bible, you’ll see that there are the Lord’s commandments in it. It’s different here than in my previous religion. I was a Born Again member and also got baptized in the Mormons’ religion. Our neighbor told me to just continue listening, and that it would be better if I would be able to listen to the doctrines. Then, I decided that I was ready to become a member of the Church of God, of The Old Path. It felt nice. I felt that it was easy for me to have mercy on others. Also, I was able to discontinue with my vices. Many bad things were gone away from me. It feels so light inside. I’m elated. It’s like I have this new life. Bro. Eli preaches well. He is truthful because what he teaches is from the Bible. He knows a lot and is so wise, because it is God who gave his knowledge. Sis. Elaine: I want to obey God’s commandments, especially because we have our parents supporting us. Sis. Elaisa: I want to obey the commandments of God. Sis. Elaine: The lessons from the doctrines are in the Bible and are true. So thanks be to God. Sis. Elaisa: Our parents are members of the Church. Ever since we were kids, my parents had always brought us to Church services. That’s why we went to the KNC [Kawan ng Cordero or Flock of Lambs] where we listened to Bro. Eli until we grew up. Sis. Elaine: I was crying because of sheer joy. I was elated. It feels so light inside. Sis. Eliza: I’m happy. I felt light. Sis. Elaine: Bro. Eli, I hope that I will get to see you personally, God willing. Sis. Elaisa: May God keep you and I hope you will have more strength. I love the teachings. Also, before my day comes, I want to have done something worthwhile in my life. While surfing channels on television before, I was able to listen [to Bro. Eli]. I don’t recall what channel it was as it was since a long time ago already. But it was in the recent Bible Exposition that I got to listen to it more intently, and it continued from then on. I felt very welcomed [at the locale]. Actually, I’ve long been wanting to know someone who can make me understand what is in the Bible. And now I have. I’m a new me. I feel like someone new. I wish you long lives that many more people’s hearts will be enlightened. I wanted to join already. I was also moved by the songs of Bro. Daniel; I got encouraged by them, and also by the songs of Bro. Eli. I was a KNC before as well; only, I wasn’t able to continue listening to the teachings. So now, with God’s mercy, I decided to pursue this. When I was in Grade 4 or 5, I was in the KNC. I wasn’t able to listen for a long time. I guess, because also of my youth and vices here and there. Lately, I’ve been pondering about it, and as I said, I got encouraged by the songs of Bro. Eli and Bro. Daniel. That’s why I became a member this day. I was crying. After I got immersed, I felt okay already. I hope that they will be able to encourage many more to join and be members here. 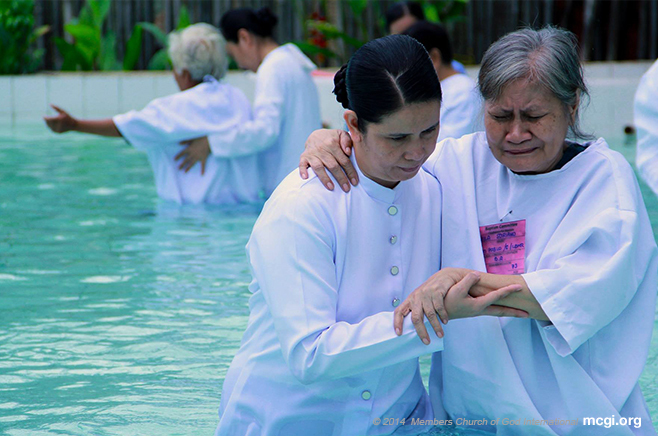 Read short testimonials of faith from some of MCGI’s youngest brethren baptized on August 28, 2015 at the ADD Convention Center in Apalit, Pampanga. I saw the truth; the teachings are truly from the Bible. Ever since I watched on television and listened continually, the words of the Holy Scriptures gradually sunk into my heart and mind. I feel good. I feel light inside, as if all the pains are gone, as well as the doubts I had in my mind. For Bro. Eli, I hope that he will be able to live longer that he may be able to preach to more people who haven’t yet heard the truth. For Bro. Daniel, I hope that he will continue his good deeds: His “Isang Araw Lang” (Just One Day) motto, No good work will yield evil. My husband has long been listening and he invited me to a Bible Exposition. Alhough, I declined his invitation and told him that I wasn’t ready yet. I watched and said, “I’ll try it. But I can’t say if I’m going to like it or not.” Then, we went to the locale. That’s when I found that I liked the teachings because everything is from the Bible. With Catholicism, it’s different. It’s like half of it is from the Bible, and the other from the priest’s sermon. I learned a lot from the doctrines. It’s good because you will find all the answers to your questions there. It was a different feeling. I felt that my sins have been washed away, that they were all gone. I also felt light inside. Bro. Eli and Bro. Daniel, many thanks for the Bible Expositions that you do. The Lord made you instruments for us to learn the truth. What you teach is different from what our former religions teach. I learned a lot from you. So many, many thanks to both of you, Bro. Eli and Bro. Daniel. Many, many thanks. Perhaps, it’s God’s calling to me as nobody lead me here. I guess, it’s just like that when you are being called by God. I’ve been listening for about four years. I just watched [The Old Path] on TV. I watched it and compared it with those of other religions. I also attended their services, and listened to their doctrines. However, it’s far more different here; the doctrines of the Church of God are unparalleled. I felt light, and so different than from before. Firstly, thanks be to the Lord, and thanks also to Bro. Eli and Bro. Daniel whom He made as instruments. I’m thankful also for the teachings they preach. Thank You Lord. It’s because of my fear in God that I got from hearing His words since I was in college. Actually, I was a BREAD [Bible Readers Society] member at the Philippine Normal University. I knew there members like Kuya [elder brother] Jeff Samson, Ate [elder sister] Beth Gillen. I just listened to the Bible studies, but I didn’t decide on becoming a member immediately. I graduated first as I am older than they are. I had an elementary classmate in the Locale of Magda. He chatted me on Facebook and invited me to the indoctrination. That’s how it all began. Actually, I know almost all of the doctrines as I was eager to attend Bible studies. They would invite me to join, but I refused as my heart was still hard back then. I couldn’t yet accept things. It was on a Monday, August 11, when I first attended the Mass Indoctrination. The moment I got seated, I already cried. When [the choir] sang, I was crying and I didn’t know why. Until the time came that I felt strength in my heart that I was really going to pursue this despite the hindrances that came. I really wanted to join already as I was afraid that it may be too late for me. I have been called many times before and I have dreamed different dreams already. I think I was already being told that this was my last chance, that if I wouldn’t join, something bad might happen to me. For Bro. Eli, many, many thanks to God for preaching to us. I hope that I will be able to see you personally. I joined because I got amazed in watching the programs of Bro. Eli Soriano. The words are taken from the Bible. The meanings are really deep. That’s why I got interested in listening to him. I started listening in about 1998. I just felt that I was being called right now as many trials have come in my life. The trials I faced came one after the other. Before, I would attend MCGI gatherings, but haphazardly. That’s why I felt that I was being called already, that my life may be in order. While I was in the water, I was really crying. I don’t know if many were able to see it. Actually, the baptizer had trouble understanding my answers when I spoke. That’s why he repeated his questions, because I was really crying. The feeling was different; I don’t know what it is. For Bro. Eli and Bro. Daniel, I hope that I will see them again. Way back in 1998, I came here in Apalit and sought to see them personally, and I did. I hope that their lives will be longer for those like me who wish to join as well. I hope to be with them for a far longer time, because I know that I still have many things that I can learn from them. Because of the truth. The teachings here are different, unlike in others where it is just nothing. My friend invited me here, who is now a member. I listened during the Mass Indoctrination, and he brought me once to a Thanksgiving service. I can’t explain it. I felt so empty before. Then, “Wow! So this is how it feels.” I felt happy, so very happy. Thanks be to God as they teach truthfully. I hope that their lives will be longer and that many more people will join. 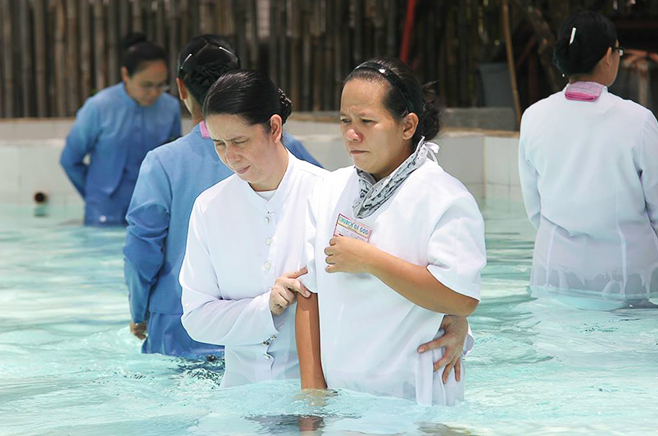 Read short testimonials of faith from some of MCGI’s youngest brethren baptized on May 22, 2015 at the ADD Convention Center in Apalit, Pampanga. I felt that I was being called to join here. My mother and father are both members. Papa already passed away. He became a member in 2004, while mama was in 2010. [In the Kawan ng Cordero or KNC], what I cannot forget learning is Proverbs 22:6 which says: Train up a child in the way he should go: and when he is old, he will not depart from it. I felt so happy, and very light inside. I hope they will continue the good works they do, so they will be able to lead many more people like us. Since I grew up in the Church and already know the teachings, I realized that I should become a member already. Ever since daddy and mama became members, as well as my siblings, I have been in the KNC starting from a very young age. All [the doctrines] are based in the Bible. Everything has an explanation. Also, whatever thing you wish to ask, Bro. Eli will be able to answer [through the Bible]. I felt super light, like I had no worries. I hope that they will be able to lead many more people to join here. I already know that the doctrines are true. Also, that I may be able to do works that I know will be for my own good. My parents have long been members, and I would go with them [to Church services]. I felt enlightened ever so clearly. My knowledge about things I didn’t know before also increased. I felt so light, like I was flying. And I didn’t feel any worries because all my past sins have already been forgiven. Thanks be to God because He gave you to teach us. I really wanted to, and because of my parents as well. Also, this is where I grew up. At first, I couldn’t express what I was feeling. All I know is that I was happy. I can’t say anything except that I’m exceedingly happy. All that Bro. Eli says are in the Bible. I hope that Bro. Eli will be able to come home because he’s long been there. We miss Bro. Eli already. I just wanted my sins to be forgiven, because in other religions, it’s different. Their teachings are really different with that of Bro. Eli’s. I live in Cavite. I’m a housemate. I only watch [Bro. Eliseo’s program] when I have no more work to do. I’ve been [watching] for a long time. My first boss was a member of The Old Path [the Church of God International]. [Concerning indoctrination], I was very happy about it because what Bro. Eli teaches is true. I’ve heard [him] on television. I really listened to it first that’s why I joined. I’m happy. I felt really happy. Many thanks to Bro. Eli. I’m really happy that I became a member because of the true doctrines. My older sister has long been a member, as well as my mother. My older sister also encouraged me. She’s a choir member in their locale in EDSA Muñoz, as was my mother in Las Piñas. I was with her in Las Piñas. Now I’m in Cavite, in the Locale of Molino. [The doctrines are] really good. I understood what the Catholic priests weren’t saying. In mass for example, those things are not explained. After or before communion, though I didn’t eat it, [the priest] would tell stories already, and that’s all. He doesn’t speak things about the Bible. I felt light. It’s like your feet weren’t touching the concrete. You were walking, but it’s like your feet kept on searching for a ground to walk on. For Bro. Eli and Bro. Daniel, oh how pleasant your teachings are in the Bible! I really can’t say anything about them. Many thanks, many thanks to God that I was baptized this day. It’s my birthday today. My mother is already a member, and I see [certain things in] her. She also wants me to be a member, so I joined as well. [On Bro. Eli’s teachings,] all questions have answers, and they all come from the Bible. I’m thankful because he teaches from the Bible. I really like the way Bro. Eli leads. It was only last month when I [first heard Bro. Eli]. It’s good. We understood every teaching. He really explains it well. I felt happy and light. I have been seeing this before, but I didn’t pay attention to it. And it’s because of what other people or my family might think or say about me. Then, it seemed like I have been called a few times already, but I didn’t respond [every time], so I was bombarded with problems. One time my friend brought me [to the indoctrination], but I didn’t pursue it so I had problems again. Years passed by and I still didn’t give it time. Then lately, as I watched the program continually, it was like I had a dream again saying, “You’re very hard-headed.” So I took it seriously from then on. I can’t interpret it much, but [in the dream] I was doing something. Perhaps, this is it. This is where I found it. I can’t explain it. All I know is that there were many people before me. I felt somewhat light. I also wished for something back there, but it’s for the better. I felt that this is the true Church. Also, it’s unlike others that… I really felt that this is the one. I also wanted to change my life. My uncle and aunt would take me [to Church gatherings]. Then, [I listened] on TV and on radio, and through every other means like on the Internet and in Bible Expositions. I have been going with them since 2010. This year, I felt that it was time already. The feeling was so light, like I was a new man. I felt clean, and as if I was floating on air. That’s how it felt. I hope that they will be able to continue with God’s mercy. I hope that they will be able to help many more people like me. Read short testimonials of faith from some of MCGI’s youngest brethren baptized on April 10, 2015 at the ADD Convention Center in Apalit, Pampanga. I felt, as they call it, the calling of God. At first, I just watched Bible Expositions [on UNTV]. And then, I felt that I wanted to listen to it almost every night; I come home [from work] at 12 am. I wouldn’t go to sleep until I hadn’t watched the Bible Expositions. I was just surfing channels looking for something to watch until I saw Bro. Eli preaching, and I stopped there. From then on, I continued [listening] and watched it nightly. I wasn’t content until I hadn’t heard [Bro. Soriano]. It was like I loved always hearing the teachings. I made it a daily habit until I [met] a brother-in-faith at work. I asked him where an [MCGI] locale was, and he said to me, “Join the indoctrination sessions,” so I did that. With the help of the Church Worker there in Kamias and of Bro. David who aided me, I thank God that I have been baptized. Many thanks to God. I’m so happy; I can’t explain it. It’s like I was called by the Lord, like there was a calling that happened to me. All of a sudden, I liked reading the Bible. Also, my friends, who are brethren in the Church, were able to encourage me to attend the indoctrination sessions. I was also able to listen on television, [and] everything I heard from [it] was true. It has been two months since [the first time I listened]. I watched on TV daily and listened to the doctrines weekly, every Sunday. That’s why it took me a long time [to finish the indoctrination]. It was like I was studying carefully whether the teachings of the Church of God are right or not. But out of all the religions I saw, this is the right one; no[doctrines] are added nor taken away. That’s what I liked about this religion. It’s inexplicable. It really feels light inside, like you’re a new [person]. It really feels unburdening. My only message for Bro. Eli and Bro. Daniel is that I’m really thankful because I know that the religion that is the Church of God is true. I hope that they will be able to encourage a greater number of people [to join the Church], that they may be saved. Because the preacher is true and faithful and the teachings are true and are written in the Bible. I’ve long been [listening] as my uncles would bring me to Bible Expositions. It was in 2012 [when I started]. Now is the right time and opportunity [to be baptized]. I’m happy and it feels good that my being has been changed; the evil things that I did before have now been buried [with Christ]. I hope that they will be able to spread the word of God more in the whole world. I was assigned in Laguna in the Megapack Co. Then, my fellow security guard and I would watch Bro. Eli on television. He’s already a brother-in-faith: Bro. Mark Simple. He was the one who invited me to worship services until I liked [attending] it. It was my first time to [hear] him on TV. For me, he bases everything in the Bible; he hides nothing. What he [preaches] is in the Bible. It was somewhat nice, like I feel that I can go forward with my journey towards a new life, towards getting closer to the Lord. [I realized] that salvation is in Him, and not in anything else. After I [got out] of the water, I thanked the Lord and asked Him to guide me that I may not be lost again, because I cannot do it alone or without Him. My message for Bro. Eli and Bro. Daniel is that they may continue their service for many more lost people, many more lost [souls]. I hope that their lives will be longer that they may be able to help more and more people with the teachings of the Lord. I was able to listen [to Bro. Eliseo Soriano] as I was a BREAD [Bible Readers’ Society] member before. As I listened continually, I got enlightened. The [doctrines] are very good; they really go straight into your heart. I can really see the work of God, like in my baptism a while ago. I feel exceedingly happy; I can’t explain it. It was really pleasant. I felt like I was floating. I hope that God will keep on guiding them that they may be able to continue their preaching unto the world, because there are many now who are lost. It started when my uncle told me, “It would be better if you would be able to hear the doctrines,” so I listened. We looked for the locale in Alaminos. Then when I got to listen, I found that it was very different [from my former religion]. I was enlightened by the doctrines. I felt like I was up in the air. I was so very happy. May they be [continually] guided by God, and may their preaching grow wider. Read short testimonials of faith from some of MCGI’s youngest brethren baptized on February 6, 2015 at the ADD Convention Center in Apalit, Pampanga. Bro. Eli was still on Channel 13 then. Whenever I watched on TV, I would turn the dial and pass by Channel 13. I’d stop to listen for a few seconds or minutes; then, change the channel. Actually, I was still quite irritated with Bro. Eli back then because he attacks all the religions I hear about. I was Catholic, of course; I didn’t know the truth, so I became angry. Still, that went on. Everyday, I would pass by the channel, and stop for a few moments to listen. I didn’t know that what I was listening to was going straight to my heart. Even on radio, I would stay up late in listening. I would come home early. His time was at 9 o’ clock, so before 9 p.m. I would be home already. It was on radio then, and not on the television. I would fall asleep to his preaching, until His words sprang in my heart. I have attended many gatherings before, but I didn’t feel any blessing from Him. I still felt the same; the vices were there in other religions. I would be invited by my friends, by my fellow Catholics and they would share the word of God. I would attend, but then my attitude was unchanged. Until the time came, to cut it short, that I was searching – as it was the wish of my heart – for a true church that I would join. Until I found this guy [points to a brother-in-faith]. He visited our house, exchanged regards, until he invited me here. When I did, I had… I felt blessed. Even though I wasn’t a member yet then, I already felt blessed. I saw the brethren here; I saw the love. Also, I heard the words of God that are in the Bible. So I hope that on this day I became baptized, may the Lord have mercy on me, that I may continue in this. I am thankful that God used Bro. Eli and Bro. Daniel. Thank you. I’ve heard almost everyone who preaches. What Bro. Eli says, I can also read in the Bible. With other preachers, I’ve heard them all. Almost all of them are [the same]. But with him, you will really read everything [in the Bible]. That’s what encouraged me, so I got encouraged. I felt somehow light, as if a thorn has been pulled from my chest. I’m thankful to them. Because of their help, I’m here and a member of ADD [the Church of God International]. Actually, with Bro. Eli, I was still studying then. As early as 1997 I was already listening to him on radio. The line of questioning [of people] back then were more on the personal issues or personal problems, and Bro. Eli would read the answer in the Bible. Those were very enlightening explanations. He would explain about how we could face life through the word of God. That’s when I started. I’ve already been staying here [in the Philippines] for two years before I got to listen [again]. But this January he had an invitation on TV, and it’s like I couldn’t say no to it. It’s like something was urging me. “I’ll visit it,” I told myself. “Since I’ve been watching Bro. Eli for a long time, and I’m amazed by him,” I said. I have a testament that encouraged me: What he exposed on TV that’s like a rock [the Moabite Stone], where the name of God was found. I think it was since 3,000 years ago. And that’s where the name of God was really written. What Bro. Eli said was right that when you get immersed in the water… it’s like you were immersed in darkness; it’s like you were from nothingness, and suddenly emerged again in truth. Also, there’s that feeling, as what Bro. Eli said, that the Holy Spirit will be sent you. Because like what he told, we cannot do it on our own as we are weak. We need something that we cannot see; something spiritual. Even if we don’t believe it, we will feel that it’s there, and ready to help. The feeling I felt earlier was different. I haven’t experienced it before. I was baptized in Catholicism. But now I’m baptized as a brother in the Church of God. The difference is great. I hope that Bro. Eli will [continue to be healthy], because he will be able to help many more people. Help, not in the medical sense, like those who are sick. The necessities of the body are easy to attend to. What’s hard are the needs of the soul. Bro. Eli responds to the needs of the soul, which is worth unlike any other. What he went through was heavy, difficult. Actually when I was still listening on radio, those belonging in other religions have done him all sorts of malice. And I was a witness to that. Like in the Bible, it’s like they were trying to stop him. But he continued in fighting. And I believe that he is being accompanied by the Holy Spirit that he may be able to go on. In fact, he’s already old now. And one of those who used to challenge him before is now passed away. It means, in my humble opinion only, that his life is being extended that many more may be enlightened. The problem of people is that they need someone to explain things. If they will be able to hear the explanations, they’ll be enlightened. That’s just what I see. I hope that Bro. Eli and Bro. Daniel, God willing, will be able to continue the works that they do. I have long been listening to various religious programs on TV. As I listened, I was able to compare them from what they said to what their members are doing. Another thing that [convinced] me was what Bro. [Eli] said, that we’re like inside a well, and all we see are the walls within. “Get out of the well, that you may see how wide the world or the sky is.” That’s when I concentrated on listening to him. But I realized that it’s not supposed to be like that. Of course, in myself, I already heard the good examples and I want to bring them here, that I’ll be the one to initiate it. I know however that it’ll be really difficult to [make them leave] Catholicism. But as was said, though I may not be able to persuade them by words, then I’ll be a good example. They need to see in me that, “Oh, he’s like this already.” Though, I wasn’t a drunkard nor smoked, nor was in vices even then. Only, I was hot-headed. Actually, I should’ve been a member before, but I told myself, “I should fix myself up first, so that it won’t be embarrassing. If I’ll be there and my attitude is still the same, they’ll see no change in me, as if nothing happened.” But I couldn’t do it on my own. I was ready. I already knew what happened, so I just felt calm really. No hesitations. That was all that I was thinking. My mind was already in what’s going to happen. I hope that… I heard [of news] that he was old already. I told myself, “I need to become a member during his time.” So when I came home, as I was an OFW [Overseas Filipino Worker], I told my wife that I’ll… as my wife knows. My wife wants me to become a member as well because of adultery. That’s the first concern my wife had. Of course, though I can say that I won’t commit that, it’s like she will feel more at ease if I will become a member here, because she knows [that people change here]. Perhaps before, her trust [in me] ranges from 60% to 70%. Now it’s about 90% to 95%. I hope that he will have a longer life that he may be able to lead many more like me, like my family. I also want for them to hear or to know the truth. The same with Bro. Razon. I hope that this organization will become stronger. For us, I hope we will be able to do our part. Read short testimonials of faith from some of MCGI’s youngest brethren baptized on January 30, 2015 at the ADD Convention Center in Apalit, Pampanga. The reason, of course, is we all have our own responsibilities before God. So we must seek the truth; we must find where righteousness is. You have to investigate all religions first to know whether which one is really of God. After you have compared them, you will know which one is true among them. God will help you and make you feel in your heart what’s right. In these times however, you need to be careful because there will be many false prophets. So you really need to fulfill your duty as a creation of God. It has been a long time since I was able to listen [to The Old Path], around 2002 when I got to watch on television. They had the program Ang Dating Daan. It’s the day I’ve long been waiting for as it’s the first step that I’ve really been asking from Him: I’m going to ask for forgiveness; I’m going to serve truly. So I feel happy inside because the Holy Spirit will correct all the wrong things I’ve done that I may return to Him completely. Actually, I’ve wanted long ago to be indoctrinated. But I wanted to be sure first that I was really sorry of the sins I committed, and not just get indoctrinated and then turn again to your evil ways. 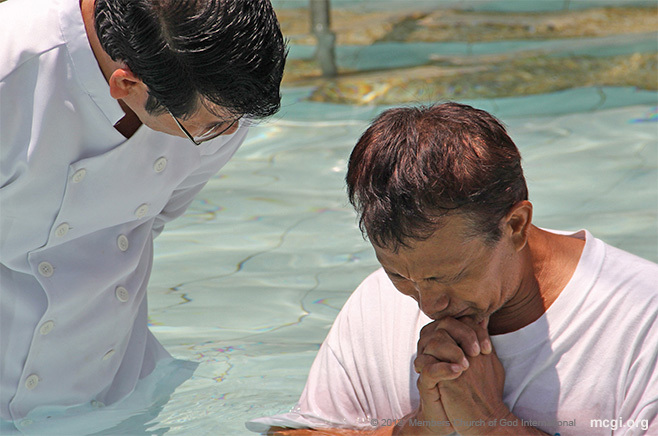 You must really be sure that you’re going to serve, because you will only get baptized once in the right religion. If you will repeat that, you don’t anymore have that baptism. You won’t get saved should that happen. My message to Bro. Eli and Bro. Daniel is that I’m thankful that God used them to fulfill the duty from the Lord to spread unto all nations all the teachings and doctrines of the Lord Jesus Christ. So to those who are investigating, may they search for the truth. May they not waste their lives on other things. They need to find what’s the most important of all – to serve God – and seek the righteousness of God. Firstly, I have learned a lot of wrong things about what I thought to be right in my former religion. And according to my investigation, everything here is right and is written [in the Bible], has basis. The other things I have also learned from watching, listening to Bro. Eli. I will never see a preacher like him in our time. You really can’t compare anyone else who will speak the truth, be it pleasant or not. It’s unlike hypocritical religions now who will only speak pleasant things, especially those that will favor them and the religion they belong to despite being wrong that their membership may increase, even if it’s just hypocrisy. Bro. Eli isn’t like that. He really says, “It’s like this,” frankly. That’s what I liked about him, his being frank, and everything is written, and has heart. I could say that I discovered him. I just felt it. Discovering is different from feeling that this person – upon my listening and watching him – is different; he preaches differently. There was a spirit that [encouraged] me. Actually, I’ve been listening since the 1990s. And in that long period of listening to him, I learned about what he says, “having a hard heart.” I told myself, “I think he’s referring to me,” until many times passed by. I should’ve been baptized in the Year 2000, but the problem was, I found out, there really are many demons. I was fond of vices. In the end though, my smoking, my gambling, my drinking gradually ceased because of my listening and watching [Ang Dating Daan or The Old Path]. Also, I have been with many… I said, “I will make friends with [members] … What’s in here?” Then I had an elderly friend named Roberto. You see one time I was caught in a tight situation; I had no place to sleep in Manila as I’m from Bulacan. Someone invited me to the Transient Home [in Caloocan]. I had no money then, and I felt indebted to them. I told myself, “I will return the favor one day as I am indebted to Ang Dating Daan [The Old Path].” I still called it The Old Path then, and not Church of God. I was able to sleep there, and I said, “I feel a great amount of debt here.” Imagine, I was three days there, and another time came that I was there. I said, “The people here are really nice.” You will really be taken cared of well. There was a brother there; now, he’s my brother as well as I am now a member. I’ve been searching for him. He gave me money; he just said he was Bro. Roberto. He is already old, and kind. He was the one that opened the door for me to continue [becoming a member here]. I feel light inside, as if I’m a new person. I’m really happy, unlike before. It’s only now that I feel like smiling. Before, I always seemed haggard, like I was weary. Now, I’m happy like “Thank You my God.” It’s not like before that within me, on my mind were only gambling, womanizing, drinking. That’s where my life revolved around. Now the only vice I have is food, the word of God, and of course, literal food. I hope their lives will be longer, and may they be able to continue. I’m really very thankful that we had here in the Philippines someone like you who is different and true. You’re unlike any other who is frank and says it all, be it good or bad… Unlike in other religions wherein they will also say what’s good, what’s favorable for their religion, all hypocrisy. They don’t want what’s painful. But that’s what can heal. You feel pain for you to be edified. Bro. John: We wanted to know the true word of God. We already want to do what He commands, what He wills. Sis. Shiela: That’s also what I’m going to say. For me, this is the right one. My relatives just told me about this. However they aren’t members yet, but they listen. So we listened as well. Bro. John: We talked about it. “Let’s turn back unto the Lord.” We actually listened for a long time. Sis. Shiela: When I was still in high school, my grandmother listened nightly, so I was also able to listen. Even when she was asleep, the television would be loud. Even if her eyes were closed, the TV could not be turned off as she is going to listen. Bro. John: I’m happy as I’m leading a new life because all your sins have been forgiven and the Lord has accepted you. It’s delightful. Sis. Shiela: The feeling is different. It’s hard to explain what happened. Bro. John: May the Lord always guide the service that you do to people. I hope that you will be able to encourage people to change, to obey the commandments of the Lord. May God bless you. I felt that it was time for me to become a member already. That’s what I felt. I was only able to listen through my husband last year. It was continuously, until this time now that I felt that it was time already. It feels good, like all my surroundings were bright. I feel light also, as if all my worries and things like that disappeared. May they continuously give teachings from God, pleasant doctrines and good works. May they have good health. Before I have already been fond of listening about religious matters, until I was able to watch Bro. Eli on television. That’s when I got encouraged. With the Lord God’s mercy, I feel light inside. I feel my worries about life have changed, unlike before. I hope they will continue… I hope that they will be given longer lives by the Great Lord. I hope that many more souls will be saved, will be given opportunities [to be saved]. I found the Church of God; it is perfect in the Bible as the Bible says it. In my former religion in the Born Again, obeying is not much emphasized. Many teachings aren’t taught there. Others pastors are really for the money, but here it’s not. It’s you who will decide [what amount to give]. Since you are already cleansed from sins, you’re free; thanks be to God. And that is well explained here, especially when it comes to baptism. But in others, it is not so. This is my third baptism, and probably the last, and here’s where I’ll stay. The teaching is good; it’s truthful. I felt good after I got out of the water. As was said, “new creation.” Everything was forgotten; all was included in Jesus’ death. In my family, all of us our Born Again members, down to my grandchildren. I’m the last to be a [Born Again member]. But now my [hope] is that I may bring them unto the true church. My message to others is to just seek the truth, and the truth will set you free as was said. Just continue the good work, because your work is really that you are really being anointed by our God. That’s all. Same with Bro. Daniel, to continue doing what they do now, helping other people no matter who they may be. Read short testimonials of faith from some of MCGI’s youngest brethren baptized on January 23, 2015 at the ADD Convention Center in Apalit, Pampanga. All the reasoning is in the Bible. I feel that the doctrines about Jesus are true. My uncle invited me to the indoctrination sessions. It’s like I felt relieved inside. It felt so nice and light. I prayed before I was immersed. After I got out of the water, the feeling was pleasant. I hope that they will have longer lives. May the Lord grant them so that they may be able to lead much more many souls. The preaching here is really good. It was my in-law who invited me here. I felt good. I felt relived and it’s really a wonderful thing, really, really nice. Many thanks to [them]. I learned to [obey] the Lord. Sis. Donna: I was able to listen to the preaching of Bro. Eli. I see the truth in what he says are based on the Bible. I haven’t seen any religion like this Church of God. When I was watching [The Old Path] about one year ago on television, it wasn’t serious listening. Then one time, [I heard] something striking about my former religion that is really wrong. Bro. Gilbert: As what my wife Sis. Donna said, we have been listening to Bro. Eli’s preaching before through my brother, Bro. Edwin, as he became a member first in our family. I can’t remember the exact year he has become a member, but it has been since a long time ago. He had a severe illness. But I saw his faith; he didn’t let go of it. Despite his sickness that brought pain to his entire body all day long, he didn’t forsake his belief, even when we tried to bring him to an albularyo (witch doctor). His belief was firm in that it will be God who will give the solution to his problem. So I was also able to listen [to The Old Path] as he watched on television, and I got to hear what Bro. Eli was saying. I’m happy that I got to be with my wife here. At first, we almost argued about it as I didn’t want to go to church anymore. I just went with her because I wasn’t yet a member of the Church of God. When I didn’t go there anymore, she didn’t also. One time, I was just surprised to see that she had been listening too. Sis. Donna: I feel light and happy inside. It’s like a load has been lifted off from my chest. Bro. Gilbert: Oh I feel so light! After I got out of the water, I felt so much happiness. Sis. Donna: I wish that you may have longer lives that you may be able to serve many more brethren. Thanks be to God. Bro. Gilbert: My message to Bro. Eli and Bro. Daniel is that may their health be always good that you may be able to serve many more people, not only here in the Philippines but also in different places of the world. I have proven this to be the right religion. Also, I saw that their preaching is honest. I’ve been listening since long ago on television. That’s when I got to listen first, on television. It’s been about 16 or 17 years. “Ask Bro. Soriano” wasn’t even on yet then; it was just Ang Dating Daan [The Old Path]. I attended a Bible Exposition in Calamba, Laguna. That’s when it started. Before I got to listen, I wen abroad, in Jeddah. When I returned here, cable TV was already widespread. I got it installed and that’s when I saw Bro. Eli again, preaching. It was then that I decided [to become a member]. I feel good, like it’s a light feeling. I feel like a load has been lifted off my chest. I feel like I have a new life, a new hope. I hope [they] will be stronger. May God continue to guide them that they may be able to save many more souls. I believe that there is no salvation but in Jesus Christ only. I felt nervous, because it was said, when you become baptized, there will be challenges that will come to your life, the difficult challenges. But I told myself that the baptism is the opportunity for me to change my life, to be of God. Many, many thanks because my mind, my heart have been enlightened, as other have been enlightened as well. I am proud of what Bro. Eli and Bro. Daniel are preaching. I’m proud because it can solve all our problems. I was looking for a good television channel to watch when I found UNTV 37. That’s when I got to listen to the goodness that Bro. Eli is preaching, like on how we can solve problems. I’m happy, and I really was in tears, especially when Bro. Eli said that all problems have solutions [with God], as it is not the chicks who will solve the problems, but the mother hen. I’m thankful, and we are really proud. I hope I will be able to bring my family here. Ever since I heard the preaching of Bro. Eli, it felt good to listen to. I have been attending [MCGI services] in our place since then. It feels good. It’s like all the anger in my heart are gone. Actually even before I was baptized, I already cried just upon arriving here, and also before I was immersed. I can’t explain what I felt, but my tears just fell from my eyes. I hope that they will live longer that they may reach many more people. I wanted to join the true Church. This is where I found the truth, and that’s why I got baptized today. I came here because it was through him [Bro. Eliseo Soriano] that I heard the truth. Bro. Eli makes sense. It’s like he is guided by the Holy Spirit because he is able to clearly explain what’s in the Bible. I feel light, joyful, happy, like all my sins are gone. I feel that I have been cleansed. I hope that their lives will be longer, and for them to be able to spread the teachings of God to the whole world. I saw here the true teachings. My husband left our former religion, so I left it also. He was the one who brought me here. He was really a handog (offering) to the church. He just persuaded me there being his wife. I watched on TV first, on Channel 37. Then he said to me, “I won’t persuade you to join; just listen. You will be the one to decide what you want to do.” He told me that I should decide after I finish the indoctrination sessions, and that they will not force me to join. We always watched; that’s the only thing we watched. I feel so happy because I’m finally here wherein I will learn the word of God. I’m happy as well because it’s here where I found the truth. Bro. Eli, Bro. Daniel, many thanks for what you teach to us. It’s not only me who’s here today, but we are many – more than a thousand. Thanks be to God that you became the way for us to know the true God. It is only here that I found the teachings that aren’t in other religions. Everything a person needs to understand about religion is being explained. My father listens to Bro. Eli, so even when I was still a child, I already saw him. I really like it when he explains about the Bible. I was still in elementary or in high school then. I didn’t hear it from other religions, only here. I feel happy and light inside. I’m really very happy. Many, many thanks. Thanks be to God because they are there to teach the true doctrines of God. I learned all the teachings that are in the Bible, all are really teachings of the Lord our God. I started [listening to The Old Path] on television, on UNTV 37, about one year ago. In the morning, after lunch, before the KNC Show and after the news, I would watch it even in the wee hours of the morning when there was a chance. I read the Bible, though I attended Catholic mass. Though I went to church, I didn’t kneel down before [the graven images] because I know the teaching that it is wrong to do so. Someone invited me before, Bro. Romy of the Locale of Plaridel. He invited me once to the indoctrination sessions in 2007. After the first time, I didn’t attend because I didn’t mind matters of salvation then being a gay person. Despite that, I continued listening on television. I watched it even as I worked in my salon, while cutting the hairs of my customers. I feel so light, like all the doubts have all been gone. Many, many thanks to God for giving us Bro. Eli and Bro. Daniel to preach the truth, because the teachings of other religions are not in the Bible. Sometimes, they would add or take away something from it. But their preaching are really in the Bible. That’s really all I can say because before I didn’t speak of such things, about teachings or about religion. My mind feels like it’s afloat, like I’ve been truly cleansed. I was even crying because… the feeling is really different. I’m thankful that because of [them], I was enlightened. Since 2009, my mother and father have already been members, so my siblings and I would go with them [to Church gatherings]. But among us, it’s only me who has so far been baptized. I’m the youngest. I intended at first to keep it a secret [from my family], so they would not think that I was just being forced. But of course, I had to tell my mother my whereabouts, as I would go home at night, so eventually my father knew as well. I still can’t believe it, even until now. I feel like I’m not myself. I still felt like crying after it. When I got out of the water, I was just walking and walking and felt like I was floating. For Bro. Eli and Bro. Daniel, I am thankful because you still continue to encourage people who do not know the true doctrines. I hope they will not tire, and may they continue to be guided by the Lord. Read short testimonials of faith from some of MCGI’s youngest brethren baptized on January 16, 2015 at the ADD Convention Center in Apalit, Pampanga. I heard the true teachings of God. I learned the word of God through Bro. Eli, and by always listening to [Ang Dating Daan or The Old Path] on UNTV, on the Internet. That’s where I got persuaded [to join]. Actually, it was just an accident. In about 2003, I just happen to switch the channel there, and I got to listen. I doubted at first because I didn’t understand it. But as I continued listening to Bro. Eli, that’s when I saw the light, the real word of God. Nobody invited me. I just went to the Locale of Dolores. I asked this from God. I wasn’t satisfied with my former religion; it’s like, I was confused, like there was something missing. I prayed and I just found myself suddenly thinking about what it was like listening to Bro. Eli. Because of Bro. Eli, I heard the true word of God. Then, it’s as if my two feet just carried me to Dolores. It’s as if I didn’t feel any pain. During the indoctrination sessions, I went through a heavy trial. Actually, I felt as if I wouldn’t be able to go through with the baptism. But with God’s mercy, I was able to finish it. The emptiness I felt is gone. Though the trial I faced was painful, I felt that all of [the pain] has gone away. I don’t feel it anymore. It’s like you’re at peace already. I hope that someday I will get to know them, see them. I pray to God that He may guide me that I may last here. As Bro. Eli said, there are many trials, many things that I will go through as I walk here. The reason is deep. When I went to Saudi, it’s Bro. Eli’s words on television – that I got to hear only twice – got imprinted in me. I attended Born Again, Jehovah’s Witnesses gatherings there, but I could never forget the words he said that have entered [my heart]. It was in 2007 when I was in Saudi. There were many religions that invited me. I would go with them, but I never got baptized. It felt so light. I felt even lighter. I hope they may continue. May they be far from perils and from evil things that they may continue helping us in our faith in the Lord for us to be able to continue until the end, until our salvation. Since I was a child, my mother would always have a radio by her side whenever she took care of me, and she would listen to Bro. Eli. As time went by, my two older brothers became members as well, except for me as I had a hard time then accepting the doctrine on modest apparel. Time came however that my two big brothers invited me [to attend Church gatherings]. I didn’t let go of the opportunity of God calling me. I didn’t want to miss that, so I joined as well. It feels good inside. The burden that I felt before, I really feel have been all washed away. I also had palpitations before baptism, but afterwards I felt relieved. I also repented of my sins. May they continue with their preaching works, and may they be able to encourage many more unto this religion, because I know that this is the right one. I felt that the Lord was calling me, because I felt that I had so many sins. My sickness became a way for me to be closer to Him, so I pursued [becoming a member]. It was on television that I saw it [Ang Dating Daan or The Old Path]. Sometimes my tuning in would go on for a while. I felt that He as calling me. It has been on for a long time: Ask Bro. Soriano. I have heard about it and would sometimes view it briefly. One time, I saw that the topic was good and felt that there was a good message in it. I felt peace. In my heart, it’s like I feel so much anger. But after they immersed me, I suddenly felt unburdened. Then the hurt I felt in my body was relieved. May you continue with your good works towards our fellowmen and in preaching. Many, many thanks. Actually, it was just an accident. In about 2003, I just happened to switch the channel there, and I got to listen. I doubted at first because I didn’t understand it. But as I continued listening to Bro. Eli, that’s when I saw the light, the real word of God. It felt so light, even lighter. It feels good inside. The burdens that I felt before, I really feel have been all washed away. I also had palpitations before baptism, but afterwards I felt relieved. I also repented of my sins. It was on television that I saw it [Ang Dating Daan or The Old Path]. Sometimes my tuning in would go on for a while. I felt that He was calling me. In my heart, it’s like I felt so much anger. But after they immersed me, I suddenly felt unburdened. Then the hurt I felt in my body was relieved.